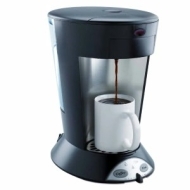 alaTest a collecté et analysé 18 avis de consommateurs et d'experts pour le produit Bunn MCP 1.25-Cup Coffee Maker. La note moyenne du produit est 4.2 sur 5, tandis que les autres produits de même catégorie ont une note moyenne de 4.2 sur 5. De nombreux avis apprécient le bruit. L'ergonomie impressionne, mais les auteurs d'avis ont des doutes sur le rapport qualité/prix. Après analyse des notes de consommateurs et d'experts, de l'âge du produit ainsi que d'autres facteurs, et comparé aux autres produits de même catégorie, le Bunn MCP 1.25-Cup Coffee Maker obtient un alaScore™ de 79/100 = Bien. I don't get what's so great about it! I cannot be happier with this machine. It works quickly, like a charm. Coffee is very hot (would not want it hotter). I've been wetting the pods beforehand and using the tea button to brew my coffee -- could not be happier with the results. Does not work with softened water !!! Appearance, Does its job very well when it works. Drinks always hot. Compact design, VERY hot coffee, simple to use. Works at 7,000 feet above sea level! Full water mark difficult to see, strangely variable amounts of coffee on occasion. We live at a little over 7,000 feet above sea level. The first pod brewer we tried could not fill a cup for love or money. Finally I saw in small print - "Not for use over 6,000 feet". We returned it and I researched this time. I love coffee & tea. So when I researched for the right single-serve for me, I was looking at the Bunn My Cafe Professional Grade & The Keurig B50. In the end, I ended up with both, the Bunn for home & the Keurig for work.